You are here: Home › Exhibition reviews › Objects and visual analyses › Circulation, Appropriation and Visual Consumption of Crafts in Chennai. This summit, among other events and activities, comprised craft expositions organized at various renowned art galleries in the Chennai city. 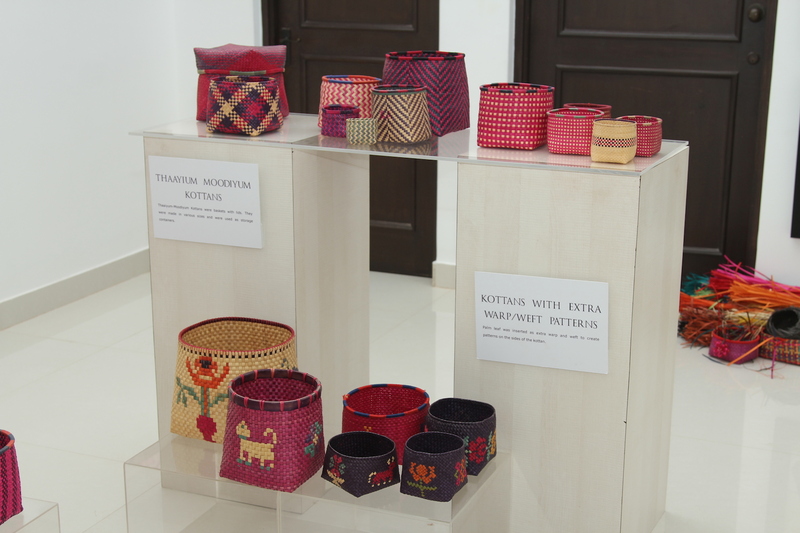 The organizing team of the summit said that they wanted to create an interface between art and craft and had labelled this initiative as the “interdisciplinary art-craft exhibitions series”. A range of crafts including textiles, puppets, baskets, furniture and home accessories moved into the art space in local art galleries that predominantly hosted art exhibitions comprising sculptures and paintings in the past. The ensuing circulation and consumption of crafts shall be the focus of my following discussion with specific reference to two examples. 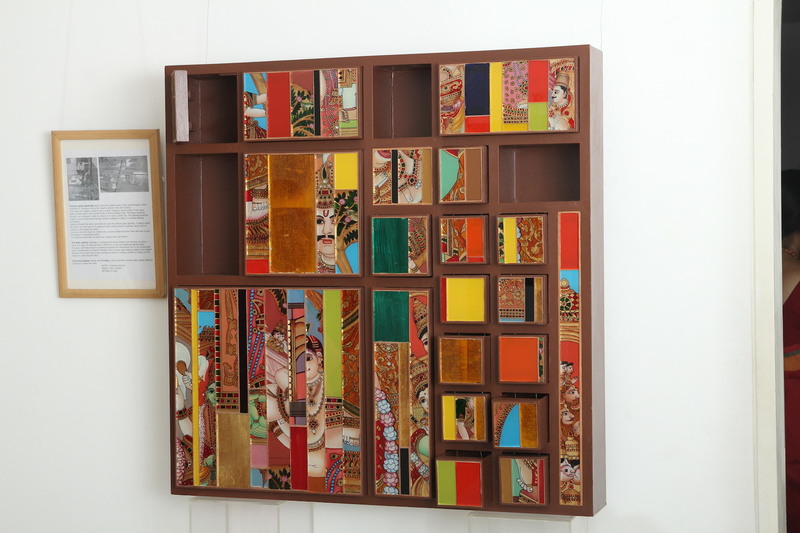 An exhibition, held in a renowned art gallery in central Chennai, showcased several works of furniture wherein various art elements were appropriated into their production. 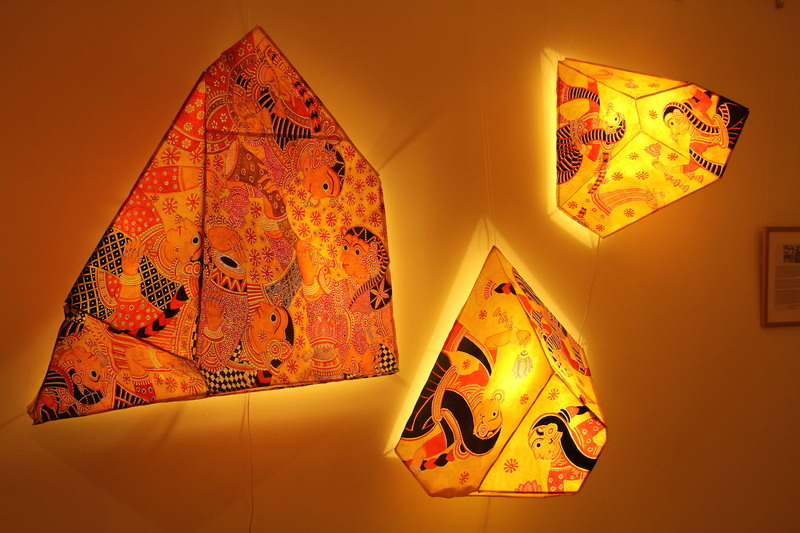 For example, folk art themes were incorporated into home accessories such as wall lights (fig:1). A set of chairs possessed hand painted back rests. In another instance, the religious themes of the Tanjore style of painting was utilized on the facade of a wooden wall cabinet (fig:2). The furniture drew varied comments from the spectators. For example, the wall cabinet in the photograph received mixed reactions from different people, both positive and negative. This piece of furniture comprising fractured images of Krishna’s face thus provoked negative reactions to the designer’s aesthetic approach and was regarded by some as a distasteful appropriation of a religious image. The above comments of select viewers of this piece of furniture also served as a reminder to me of reactions to the controversial appropriation of Hindu religious images elsewhere in the world. While the appropriation of Krishna’s image did not generate extreme responses with regard to the cabinet, in the case of the Lisa Blue swimwear collection in Australia, the images of Goddess Lakshmi on the bikini and other swimsuits, angered many Hindus. In some cities in India protests were carried out and images of her collection were burned. Many Hindus clearly did not accept the design aesthetics of the swimwear line, regarding it as a malign appropriation of an image of religious significance to the Hindus. As a result, the collection comprising Goddess Lakshmi images were stopped from being retailed and the designer had to issue a public apology. Thus the transition of religious art to contemporary craft or fashion can also lead to debates about social norms. Kottan baskets were thereby made to downplay their mundane utility and ritual context and were perceived as artistic objects as can be seen from the museum-like display and the above comments of the spectators. The exhibition of the antique palmyra kottan baskets also brought to light the importance of the constructed settings in the visual display of these objects (fig:4). A set of small baskets were displayed on an antique chest of drawers alongside traditional Chettinad saris under old black and white photographs of Chettiars. A pair of large sized baskets was exhibited below an antique painting. This display scene also comprised an antique chair and a footstool on which were placed a vernacular newspaper and a pair of reading glasses. An adjoining area consisted of brightly coloured baskets in various sizes and filled with vegetable and fruits. A section of the adjoining wall comprised a panel explaining the history of the baskets and a photographic depiction of their usage in ceremonies during ancient times in an effort to tease out the baskets’ historical place and age-old use among the Chettiars. 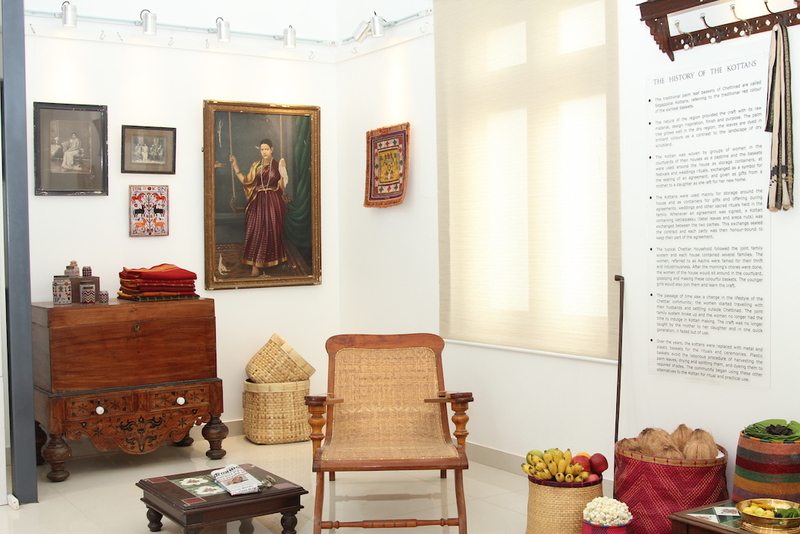 Many of the objects such as baskets, photographs, furnitures and paintings looked old and were used to create the setting of the ancient Chettiar lifestyle. The visual evidence of aging seen in the objects and the props in the basket exhibition such as rusted lids on the beaded bottles, the chipped portions of the furniture, the termite eaten patches on the frames of the paintings, the black, white and faded colours of the photographs play a significant role in establishing the age and antiquity of the objects on display and projects a heritage value. It is therefore this ‘age’ factor that places the Chettinad baskets in a privileged contemporary position in the heritage practices of visual consumption. Thus, I have tried to briefly capture the dynamics of craft production, consumption and circulation in contemporary Chennai during an international crafts event. Crafts are not static objects with a fixed status or value. Rather, as seen during the above two expositions, they traverse the shifting boundaries between crafts, art, religion and heritage in their movement across time and space.